You can use this control to create a functionally rich calendar box which shows one month at a time. The end user can move from month to month, select a date, and select a range of days when the multiple selections are allowed. You can change almost every part of the Calendar control by using its properties. The Calendar also provides events that enable you to react when the user changes the current month (VisibleMonthChanged), when the user selects a date (SelectionChanged), and when the Calendar is about to render a day (DayRender). 1. The Calendar does not use the AutoPostBack property. 2. 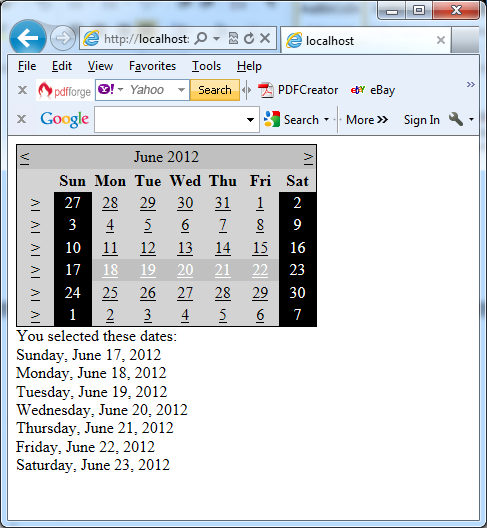 You can react to the selection event immediately, because every user interaction with the calendar triggers a postback. 3. You can allow users to select entire weeks or months, or you can render the control as a static calendar that does not allow selection. 4. If you allow month selection, the user can also select a single week or a day. 5. If you allow week selection, the user can also select a single day. The Calendar control exposes many more formatting-related properties, many of which map to the underlying HTML table representation (such as CellSpacing, CellPadding, Caption, and CaptionAlign). Additionally, you can individually tweak portions of the controls through grouped formatting settings called styles (which expose color, font, and alignment options). Example properties include DayHeaderStyle, DayStyle, NextPrevStyle, OtherMonthDayStyle, SelectedDayStyle, TitleStyle, TodayDayStyle, and WeekendDayStyle. You can change the sub-properties for all of these styles using the Properties window.